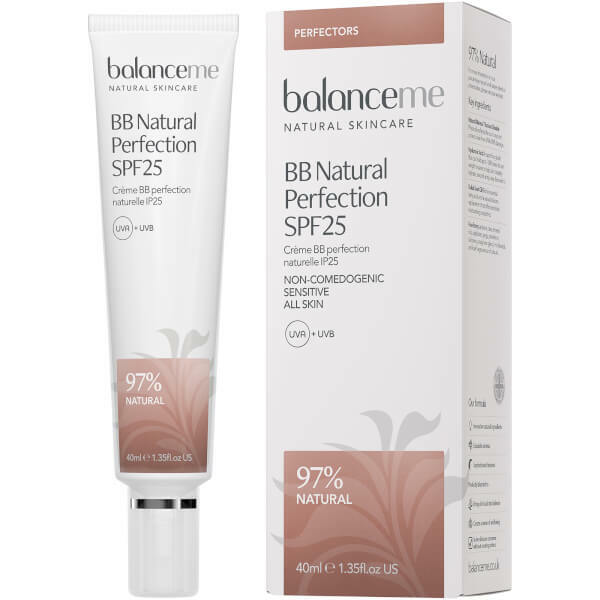 Restore a radiant glow with Balance Me's BB Natural Perfection SPF 25; a lightweight, ultra-hydrating formula that works to plump, moisturise and protect skin. 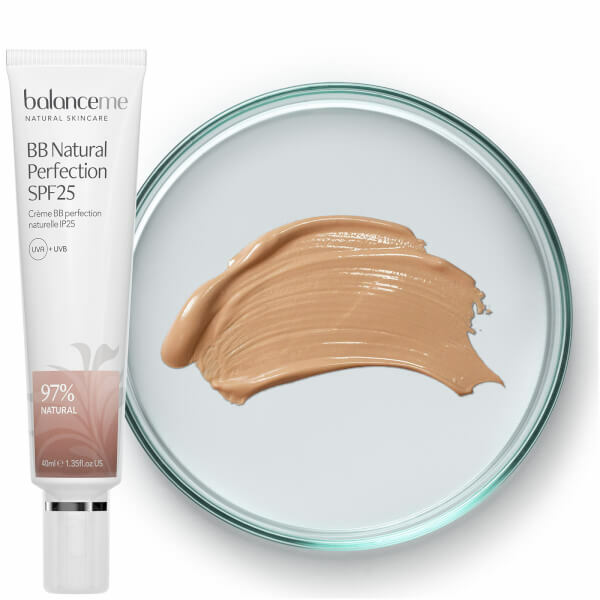 Infused with a host of beneficial ingredients, including Hyaluronic Acid, Rosehip Oil and antioxidant Blackberry Leaf Extract, the BB cream firms and refines skin, whilst delivering natural-looking coverage with a hint of colour for a beautifully even tone. 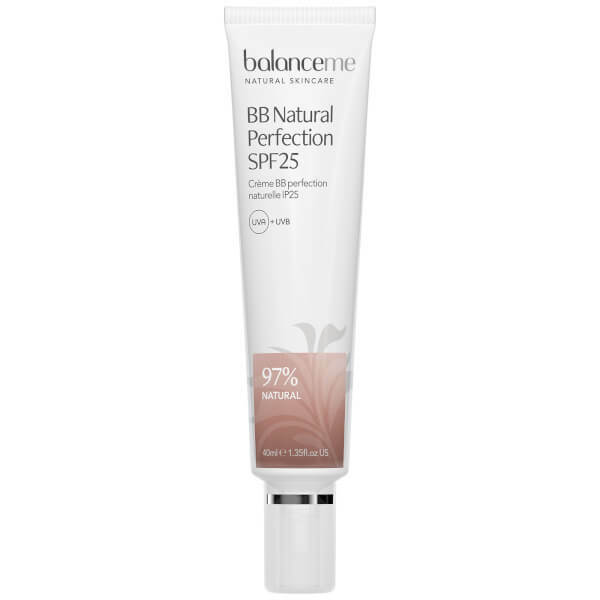 Ideal as a primer beneath make-up, its innovative sun filter is combined with Spruce Knot, Lotus Flower and Violet Seed to defend against the damaging effects of UVA and UVB rays. Skin is bright, calm and comfortable with long-lasting moisture and hydration. Suitable for all skin types. Apply a light layer with fingertips to moisturised skin until blended. Aqua (Water), Caprylic/Capric Triglyceride, Titanium Dioxide, Sorbitan Isostearate, Polyglyceryl-2 Dipolyhydroxystearate, Cetyl Ricinoleate, Coco-Caprylate, Alumina, Stearic Acid, Mica, Glycerin (Vegetable), Polyglyceryl-3 Diisostearate, Hydrolyzed Hyaluronic Acid, Sodium Hyaluronate, Rubus Fruticosus (Blackberry) Leaf Extract, Michelia Alba (Magnolia) Flower Oil¹, Crambe Abyssinica (Abyssinian) Seed Oil, Camellia Oleifera (Camellia) Seed Oil, Rosa Canina (Rosehip) Fruit Oil, Aleurites Moluccana (Kukui) Seed Oil, Aloe Barbadensis (Aloe Vera) Leaf Extract³, Ricinus Communis (Castor) Seed Oil, Citrus Aurantium Bergamia (Bergamot) Fruit Oil¹, Styrax Benzoin (Benzoin) Resin Extract¹, Anthemis Nobilis (Roman Chamomile) Flower Oil¹,Lavandula Angustifolia (Lavender) Flower Oil¹, Salvia Sclarea (Clary Sage) Flower Oil¹, Citrus Aurantium Amara (Petitgrain/Bitter Orange) Leaf/Twig Oil¹, Tocopherol (Vitamin E), Helianthus Annuus (Sunflower) Seed Oil, Rosmarinus Officinalis (Rosemary) Extract, Glucose, Sodium Chloride, Glucose Oxidase, Potassium Iodide, Potassium Thiocyanate, Lactoperoxidase, Bisabolol, Maltodextrin, Distarch Phosphate, Cellulose, Diheptyl Succinate, Capryloyl Glycerin/Sebacic Acid Copolymer, Linalool², Limonene², Benzyl Benzoate², Benzyl Alcohol², Geraniol², Citral², CI 77163 (Bismuth Oxychloride), CI 77492 (Iron Oxides), CI 77491 (Iron Oxides), CI 77499 (Iron Oxides). (¹) natural pure essential oil, (²) naturally occurring in essential oils, (³) certified organic ingredient.